(Newser) – Donald Trump has expressed his enthusiasm for waterboarding, and CIA Director John Brennan has responded that he would absolutely refuse to carry out orders to do so. 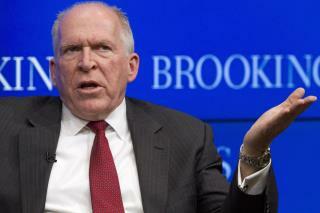 But during a Q&A Wednesday at the Brookings Institution, Brennan issued his strongest statement yet, noting he would step down as head of the CIA if he were ever asked to use waterboarding, Reuters reports. "As long as I'm director of CIA, irrespective of what the president says, I'm not going to be the director of CIA that gives that order," he said. "They'll have to find another director." Brennan emphasizes to the Intercept that his anti-waterboarding stance is his alone, not the official CIA take. Yea... You believe that I have have some very very cheap ocean front property in Arizona. Once again Liberals would rather stick up for terrorists than protect American people. This is why Obama is failing. Step right up folks. A contingent of the Newser trumpettes who rant that Hillary Clinton is a criminal will be found below spouting off with nonsense and support of waterboarding and worse torture as proposed by Da Dolt Donald. They will laugh at the illegality of it and claim it is not illegal and besides it's more important to fight with everything to bring the enemy to it's knees - ethics, morals, legality be damned. But oh ask them about Clinton and they'll go off like a holy roller, eyes rolling back mouths foaming spitting out that you are an idiot, a moron and that Hillary is corrupt, criminal, evil and must be stopped because she is..... wait for it...... a war monger. Oh the irony.